Catching trips on the flop and last to act against two players. Catching top-pair with AQ against one half-stack opponent. Squeezing with AQ in the BB. Villain overbet shoves on the turn. Getting 3bet by the BB after raising with AQs on the button. Villain is aggressive on the flop and turn - Hero has TPGK. Squeezing against three players from the BB. Small stack shoves all-in for 35bb. Raising with AQ from UTG, two callers. Hero cbets with TPTK, villain raises..
A Collection of Suited Connectors. How to play Ace Queen (AQ) in NL Hold'em. Six hand histories are analyzed and discussed. AQ is not a hand that's designed to win big pots regularly. It's usually a TPTK/TPGK affair at best, so even though it's a gorgeous hand you have to tread carefully. Therefore, a lot of the strategy in this video revolves around maximizing winnings and minimizing losses when playing ace-queen. So basically, you're going to want to learn how to get value from top-pair whilst simultaneously avoiding losing money with top-pair. It's a tricky art, but SplitSuit guides you through. There are also a couple of squeezing spots thrown in for good measure (Hand 3 and Hand 5). SplitSuit has a video dedicated to Bluff Squeezes if you're interested in fine-tuning your squeezing game. Hand 1 - Checking behind with trips on the turn in an attempt to be deceptive and extract value on the river instead. Good range analysis on the turn. Hand 2 - Missing value with TPGK due to not betting three streets against a fishy half-stack player. Hand 3 - Should you bet or check with AQ on an AJT flop after squeezing preflop? Facing an awkward overbet shove on the turn with top pair. 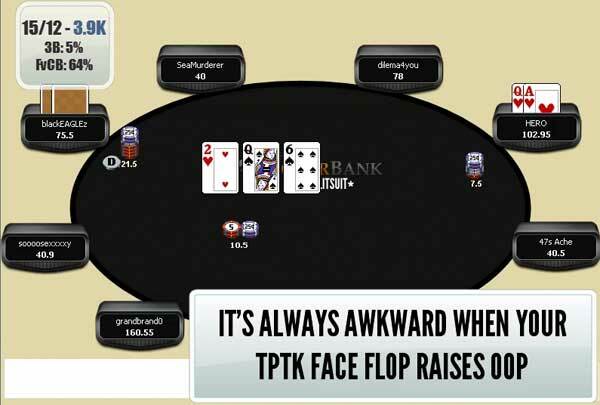 Hand 4 - Calling multiple streets with TPGK against an aggressive player who 3bet preflop. Hand 5 - Using PokerStove to work out whether or not it's +EV to call a 35bb all-in shove when getting odds of 2.3 to 1 (needing 30% equity to break even). Hand 6 - Getting raised with TPTK on the flop. Discussion on folding TPTK on the flop against a Nit (see Player Types). Hand 6 - Great flop, awkward spot. "It's okay to bet/fold top-pair sometimes." "I'd rather make a small folding mistake than a huge shoving mistake."